One of the most exciting new challenges, for me, so far this year has been the Ring a Day project on flickr. I'm a member of the Etsymetal Team, and a fine, creative bunch of metalsmiths they are, too. 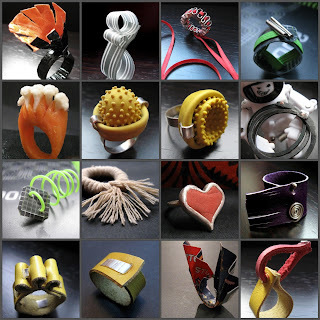 One of the team, Nina Dinoff, started this project to make a ring, every day, by any means, in any material . Open to all, it's a real creative boost and has a wonderful buzz to it. Pictured here are my rings so far. Mostly, I've used recycled materials, like leather scraps, an old diary, even kitchen string. It's a great opportunity to try new materials and ideas lurking at the back of my sketchbook . Why don't you join in? Oh, and keep an eye on my flickr uploads for my version of the ring cycle.